Simple, healthy, nourishing! 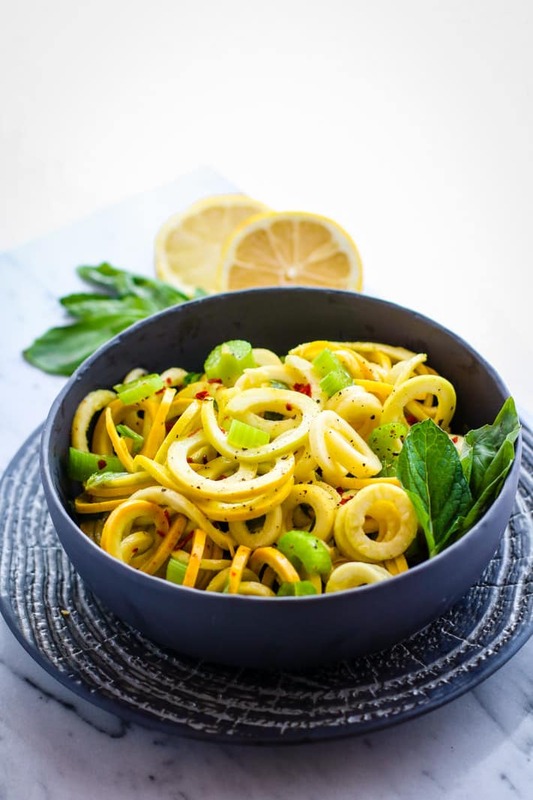 Paleo and Vegan Basil Mint Yellow Squash Spiralized Salad. REAL FOOD ingredients combined to make one beautiful spiralized salad! A naturally gluten free veggie salad bursting with flavor, nutrients, and color. 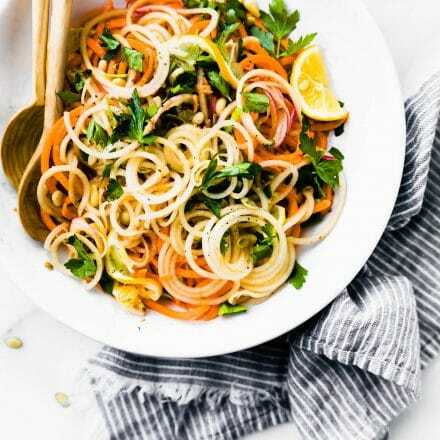 This is a spiralized salad you’re going to want to make again and again. Hello Monday! I’ve never been so excited to post a recipe for another spiralized salad on a Monday! I mean, don’t get me wrong, I actually do love Mondays, but today is EXTRA special. 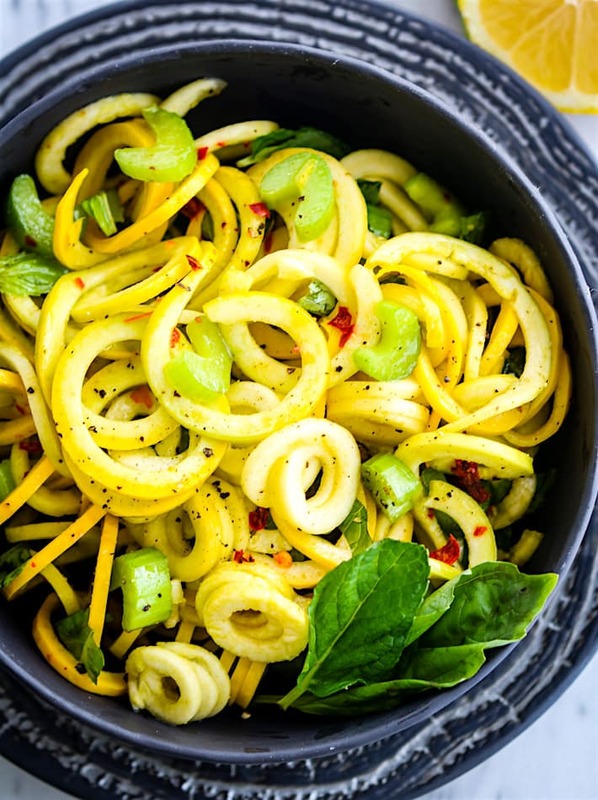 But before I jump into this fantastic Basil and Mint Squash Spiralized Salad recipe, I will explain excitement. Mmmm k? So you see, this recipe. 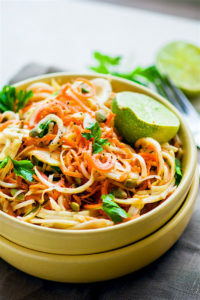 This nourishing real food flavorful spiralized salad recipe is actually from my friend Amie’s new CLEAN EATING cookbook. And I couldn’t be more honored and privileged to be able to share. Amie has been a long time friend of mine. We’ve been supporting each other’s health journey for YEARS and well… she is just AMAZING, and strong, and wise, and wonderful encouraging friend. I am UBER excited that she is now able to help others overcome health issues. This recipe from her new cookbook is really about using food to HEAL. I mean REAL healing and REAL resetting the body. No a detox, but a full on NOURISHMENT lifestyle. Amie spent the last decade trying to cure her autoimmune diseases and Inflammation! 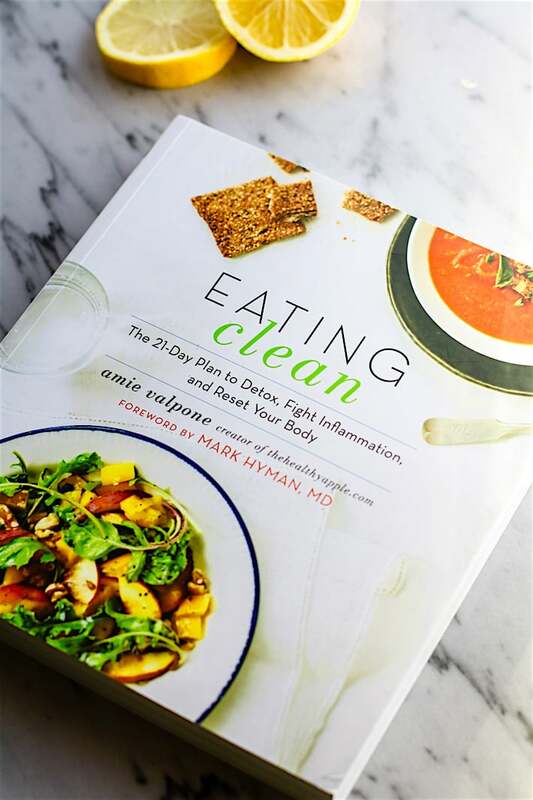 This book outlines the journey of how Amy used food and lifestyle to heal from a decade of chronic illness (like Lyme Disease) and it’s filled with over 200 nourishing, healing, plant-based recipes! Recipes free of gluten, dairy, soy, refined sugar, eggs, corn and processed ingredients. Yes, they may be free of all those ingredients but the recipes themselves are FULL of flavor and aroma! 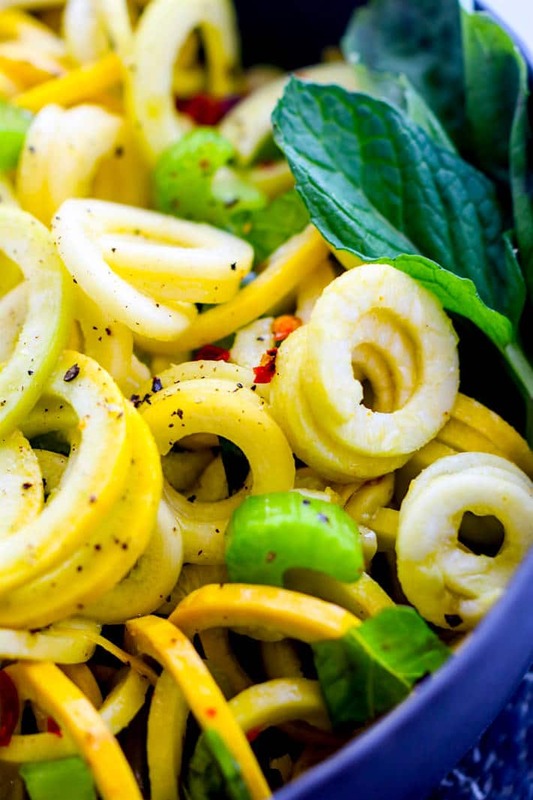 Which leads me to this Basil Mint Squash spiralized salad recipe. It is (was) definitely full of aroma and there was even a request for more once I served it. How’s that FLAVOR POWER!? Bam! Okay but in all honesty, I was shocked at how simple and wonderful this spiralized squash salad was. I knew it was going to be good, but after we made it and ate it, I was left wanting more. It’s a POWER side dish or light meal that makes real food shine. Gosh I just love howAmie does that. So simple and yet so flavorful. 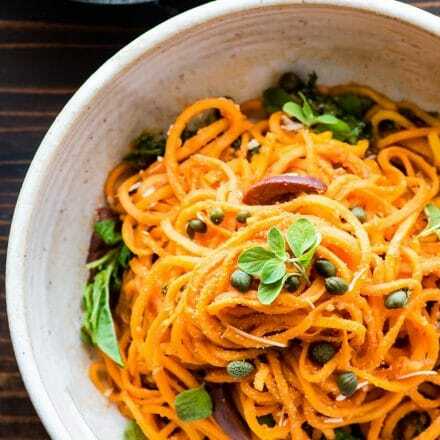 This Mint and Basil Squash spiralized salad recipe is jammed packed with disease fighting antioxidants and antimicrobial properties (from the basil and mint). 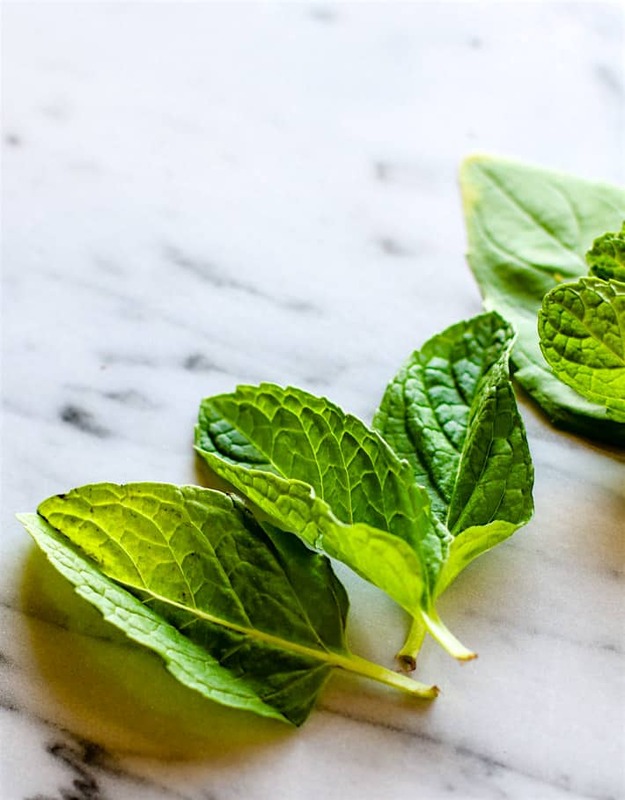 Both Basil and Mint contain essential oils that can not only help FIGHT inflammation, but they can inhibit BAD bacterial growth. That’s a double dose of HEALING ya’ll! And because it’s grain free, low carb, and low sugar, this salad is a wonderful choice for those fighting candida or small intestinal bacterial overgrowth. Basil and Mint combined Vitamin C from the lemon, Vitamin A packed squash, and healthy fats from the cold pressed olive oil, make this salad kind of EPIC in regards to health and healing. Plus it’s just plain refreshing! A fun twist on a normal salad or grain pasta recipe with about 10x as many nutrients. Genius I tell ya! Garnish with basil or mint leaves and extra crushed pepper if desired. Recipe from [Amy’s new Eat Clean Cookbook with a few of my adaptions. 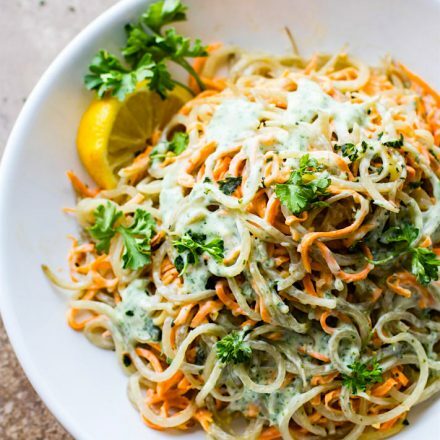 Oh and one thing –> this spiralized salad takes like 5 minutes to make. I LOVE THAT EVEN MORE! Probably because I’m obsessed with my spiralizer. Amie’s book launches this week and I highly recommend you check it out. AMAZING recipes but what’s more important is her vision and focus with these recipes. Which is to truly heal and live an abundant life. I don’t know about you, but I’m finding that to be a TRUE focus for me and my family each day. Healthy food is great but a healthy lifestyle overall is KEY. Let’s start practicing what we preach, amen!! Food is medicine, do you agree? I hope so! 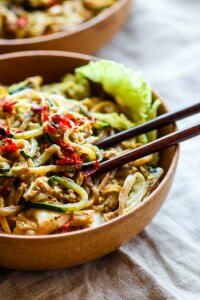 Spiralized Salads… please tell you me you’re as hooked as I am! oh girl, you will love it! Keep me posted on if you buy one!! OMG so pumped for you! You know I 100% agree with food being medicine. Love how simple this recipe is! yes! let me know if you do Alexa! 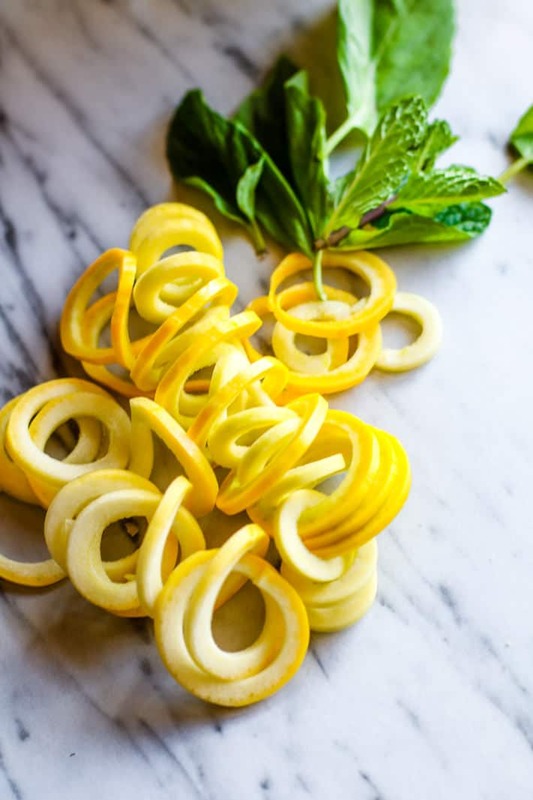 Mmmmm I love basil and mint, but even more than that I love the idea of spiralizing yellow squash. Why have I never thought of that?! Food is medicine – yes!!!! Oh, so yes! Can’t wait to try this recipe. 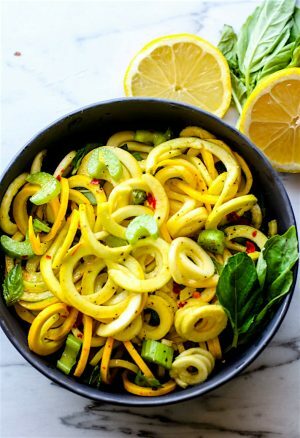 I’m such a fan of spiralized squash and basil. So good! i don’t have kids. I can play around with spiralizers all day LOL! Mmmm…this looks so vibrant, healthy, and nourishing!! That book sounds great, too. Awesome! it so is. love the nourishment. but love all the colors in her food/recipes! Yes, you know I agree food is medicine and this cookbook looks like it would fit right in with my collection 🙂 The recipe is getting me excited for warmer weather! totall! you’d love them all friend. Loove the lemon mint combo! It so reminds me of Summer. I can’t wait for it to be here. Also thank you for remindingme that I own a spiralizer. Gotte dig it out! yes! do it! i bet this would be fab with prawns on top too. your fav! Food is thy medicine!! And this is so perfectly SPRINGy! Thank you SO much for supporting me, Cotter! YOU are amazing. Thank you for featuring my cookbook. I’m grateful for your support. I love you and I hope you LOVE my recipes. Food is most definitely medicine – the best kind there is! And with that said, Aimie’s book sound wonderful – a true blessing to some! i so agree! a true blessing to me too. bring your banjo and RV to texas y’all! I LOVE the story behind this recipe!!!!!! You had me at basil. Also, I love all the spring recipes that I’m reading today. It’s so cloooooooose. it feels like summer here. Ugh, weird. But I will come visit you in spring and bring this, deal? Totally obsessed with this one!! YOU MUST MAKE! Yum!! I just shared Amie’s recipe for Sunrise Nori Wraps with Spicy Tahini Drizzle. They were SO good, but this recipe is also on my list to make! Omg I must try that next!! 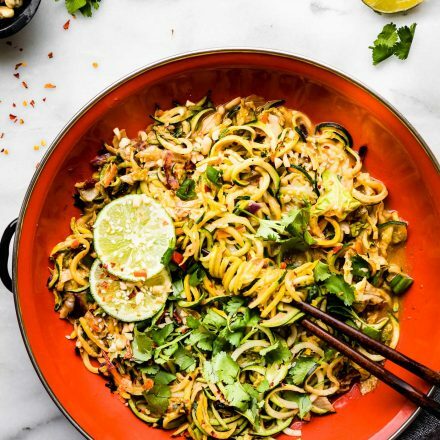 Spiralised veggies are so fun and this looks SO tasty! Love healthy refreshing salad, and I love herbs so much, thanks for you and Amy for this wonderful recipe! Pinned! You know what I am going to say …… THROW A THICK PIECE OF SALMON ON TOP … OOZING with delicious fat, and I am allllll over this! Oh but wait, I would prob scarf it down regardless! Cumin is such a neat spice – it brings so much flavor to dishes!! Mark Hyman was in that documentary about sugar with Katie Couric, Fed Up. I like what he says!! What a beautiful looking dish and so fresh. What a beautiful dish and so fresh.